Details of a residential 5-day workshop Drawing on the Right Side of the Brain, devised by Betty Edwards. This will take place at Trigonos in North Wales in May 2009. Information about the 5-day Drawing on the Right Side of the Brain course, devised by Betty Edwards. This includes links for viewing a slideshow of participants' work and reading course feedback. NORTH WALES 2nd-7th MAY 2009 Spaces are filling up on this 5-day residential course at Trigonos and it's easy to see why. What better location to immerse yourself in drawing and soak up the fresh air of Snowdonia at the same time. Trigonos is an award-winning and inspiring residential centre in the Snowdonia National Park. 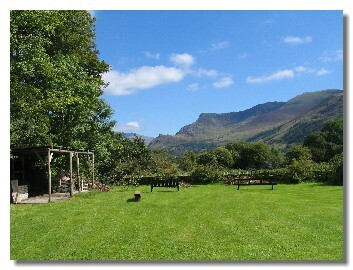 The house and grounds are nestled in the Nantlle valley, surrounded by the mountains and magnificent views of Snowdon. Trigonos prides itself on its warm, caring hospitality and its freshly prepared food – much of it home-grown. Trigonos offers a warm welcome, catering for all needs and creating a relaxing and inspiring place to learn. With 18 acres of land including a walled garden, woodlands, meadow land and a lake and stream, there are many places for walking and quiet reflection. With the mountains on your doorstep, there’s also the opportunity to soak in the atmosphere and make the most of the location. For those of you waiting patiently for news of central London courses, thank you and please bear with me. Maria Assumpta is under new management and this has meant some radical changes which means I am currently investigating alternative venues in London but I'm hoping to announce dates in the next few weeks. If you are interested in courses in the United States with Brian Bomeisler, follow the link at the bottom of the page. 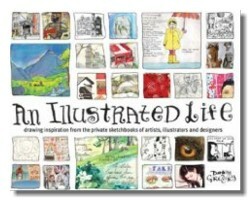 "You have taken my drawing ahead by many light years - thanks a million"
I am a huge fan of Danny Gregory and have already highly recommended one of his previous books, The Creative License as a great inspiration for keeping an illustrated journal/sketchbook. Overcoming symbolic drawing is one of the biggest hurdles to learning to draw. The head is one of the strongest symbols we use - draw a circle or oval, stick in 3 marks for eyes/mouth and, in all cultures, it would be recognisable as a face. When we come to do a portrait it is all too easy to draw a smooth oval outline for the head just to get something on paper. The result is an egghead rather than the look person we are trying to capture. My invitation to you this month is to really look at people's heads. You can do this in a check out queue, sitting on the bus or train, anyway - and you don't even need a pencil. Look at the overall shape of the head and hair. Move the pencil around - placing it along each angle/plane of the head. What do you notice? You will see that the outline of every head is made of loads of different straight lines, each at a slightly different angle. These angles inform the direction the head is facing and its angle of elevation - looking up or down. These angles also form the shape of the hair and the skull and these are the details that make us identify each person as an individual and will help you capture a likeness. Taking the time to really look at people when you are not drawing will reap dividends when you sit down with pencil and paper. Don't draw eggheads - draw people! "This is one of the shows of a lifetime. Even at twice the size it could not have been more thrilling or profound." The exhibition explores the dramatic rise of portraiture in the Renaissance. It features works by the great masters of Northern and Southern Europe, including Raphael, Titian, Botticelli, van Eyck, Holbein, Dürer, Lotto, Pontormo and Bellini. Comprising over 60 paintings, alongside important sculptures, drawings and medals, ‘Renaissance Faces’ provides fresh insights into 15th- and 16th-century art and life.